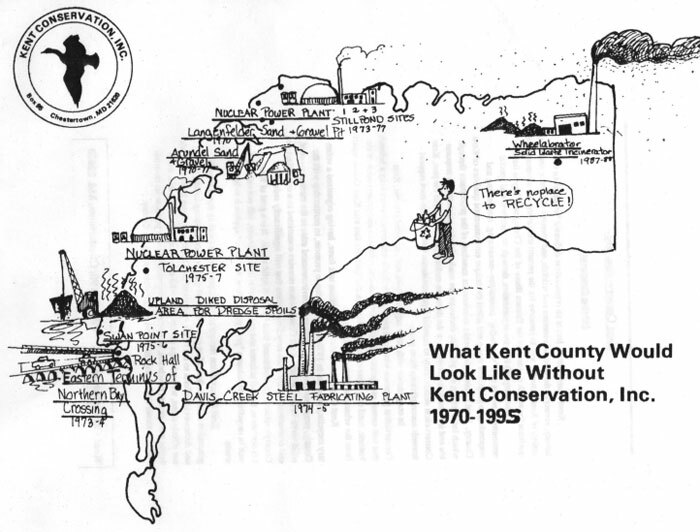 Kent Conservation, Inc. was born of a threat to Kent County’s environment and way of life. In 1970, a large corporation proposed to build a nuclear power plant at Betterton and later one at Still Pond. A few prescient people realized that this was not the last onslaught by outside interests that would threaten to destroy the county’s environmental significance and its people’s way of life. In 1971, Charles Tuley, Henry Momberger, and Mary Roe Walkup incorporated Kent Conservation as a 501(c)(3) non-profit organization. The organization’s Mission Statement reads: “to maintain the beauty, conserve the natural resources and wildlife, and preserve the peace and tranquility of Kent County, and to preserve for the present and future, the environmental qualities for which this area of the Eastern Shore of the Chesapeake Bay is Famous”. In 1973-74 the organization checked a proposed terminus of the Bay Bridge crossing at Rock Hall, which would have exponentially increased traffic and pollution and begun the process of paving over the county. In 1974-75 it prevented the installation of a steel fabricating plant at beautiful Davis Creek. In 1987-88 it battled a national conglomerate that tried to install a waste incinerator in Massey, which would have accepted and burned waste from three states. (This battle prompted local entrepreneur, Ford Schumann, to found Infinity Recycling in 1989; the business is still thriving). Since then, the organization has worked to prevent the loss of two Tolchester farms to dredge spoils placement, stopped the plan to remediate contaminated soils at the Chestertown Brick Plant, and helped to keep Walmart out of Chestertown. In 1993-97 it joined the Coalition for Safe Disposal of Chemical Weapons (CoSAD) to halt Aberdeen Proving Ground’s plans to build a chemical weapons incinerator that would have sent carcinogenic exhaust across Kent and Cecil counties. (CoSAD’s proposed alternative, a chemical weapons neutralization plant, subsequently destroyed all 1500 canisters of mustard gas without harm to people or environment). Throughout the years, the Board of Kent Conservation has always worked with other concerned citizens and organizations to preserve the County’s environment, history and character. What we see as permanent farmland, developers see as future “sites” for whatever schemes they dream up. The pressure on Kent County’s prime farmland, a key USDA designation that describes the soil’s ability to produce food, continues along with the challenges to our way of life and our self-determination. As a result, the Board of Kent Conservation unanimously agreed to merge with Kent Conservation and Preservation Alliance to continue a proactive fight for a future that we and generations that follow can truly live with.